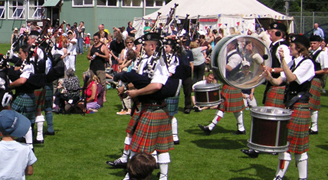 The Taynuilt Highland Games are usually held on a Saturday in late July. The day starts with a parade by the Oban pipe band marching from the top of the village to the sports field. 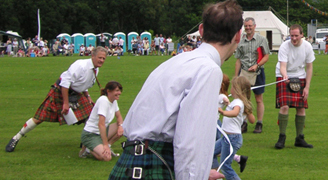 There are various events throughout the day including Caber tossing and hammer throwing, athletics, highland dancing, bagpipe competitions, climbing the flagpole, shot putt, the tug of war and a wide range of children's events. There are stalls around the field selling various souvenirs and snacks. Prizes are awarded at the end of the day for the best in each event. At the end of the day there is often a highland ceilidh dance put on in the village hall.